I have been baffled and full of consternation over the polling front runners of the 2016 race for the Whitehouse. Both Donald Trump and Bernie Sanders are filling stadiums and topping the polls for their respective political parties. Surely no one will take them seriously –my immediate thought- as they threw their proverbial hats into the ring. Their rhetoric is shocking, irreverent and- dare I say- revolutionary. They are far from the straight-laced pundits of previous presidential elections. America is eating it up. 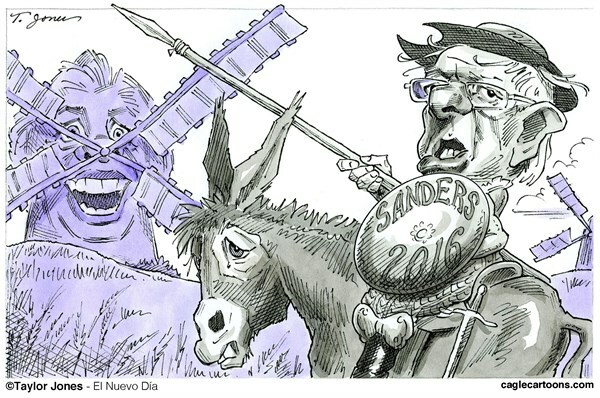 Sanders, the Democratic front runner, is the neo-socialist whose platform is to use new laws, taxes and more government intervention in the lives of Americans to “fix” inequalities of wealth, race and gender. Trump tops the polls in the Republican camp and daily increases his distance from the other 15 (yes count them) vying for the oval office. Mr. Trump is separating himself from the field by being the least politically correct politician of all time. He proposes outrageous solutions to our country’s ills, like building a wall to keep illegals from crossing the Mexican border-(oh, and getting the Mexican government to do it by threatening economic sanctions against them). He also wants to amend the Constitution so that citizenship is no longer a guarantee of American birthright. As I marvel at the success of these two caricatures of American politics and try to understand it, my conclusion is that America is mad. They are mad at never-ending wars and empty promises of economic reform. Decade after decade, and president after president, have driven us into a less free , less economically viable nation. They have given up on our political system and their approval of these nonconventional candidates is the proof. America has “Silly Slate Syndrome”. When I was a student at UC San Diego in the early 80’s, I ran for a student government office on the Silly Slate. Students were fed up with a student government that was increasing its power by instituting more and more regulations on campus reducing student freedoms. In reaction to that, a few of my friends and I formed our Silly Slate. The candidate for president on our slate could daily be seen wandering the campus in his bathrobe. I, as the candidate for Communications Officer had a platform of “I Linguini Major (actually Linguistics) I love shoes”. The students loved us and we won by a landslide over more serious candidates with more serious promises of campus reform. America apparently has its own brand of Silly Slate, but will silly fix America? The Silly Slate of UCSD made a few reforms but one by one we lost interest and abdicated our rule to our less interesting opponents. Reform was more difficult than we thought and bureaucratic red tape more daunting. My suspicion is that the outrageous promises of these outrageous candidates will be as empty as most conventional candidates.